Yesterday I blog swapped with Sarah at Sassy Red Lipstick. If you didn't get a chance to stop by her blog here is the look I put together. 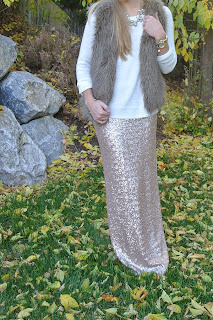 We all know I LOVE gold and sequins - pairing them with black is always a good choice! I have paired this skirt with many things which is one reason why I love it so much. It is the best neutral. I wear it so often it would be weird if I posted photos of each outfit - I've worn it with grey, black, red, navy, mint, cream, white, black, and probably more. It's so easy to dress up or down. I make and sell this skirt custom for clients - for ordering information please refer to my website www.BreeLena.com. More Holiday outfit posts to come all next week!! Happy Reading Days/Finals to the students out there! Wish me luck. Be sure to stop by the Three-Fer Thursday linkup! My look from last week was featured today by the lovely ladies who host the linkup. Be sure to stop by and be inspired by all the gorgeous bloggers out there. LOVE LOVE LOVE! Especially how this looks with the snow! what a picture perfect ensemble! 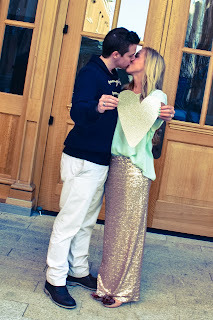 OMG the sequin maxi is amazing!!! I love this look! Love this skirt, it's so versatile!